the Tymesaver. 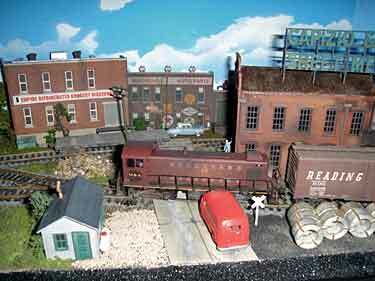 A lot of excellent small layouts are based on it. Here are some additional ones. 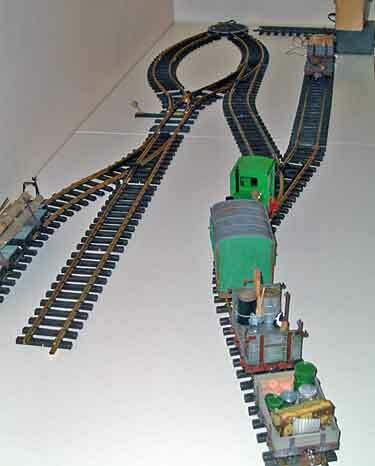 As an exhibition layout Enigma Engineering, by Paul Gittins, from Wakefield, Yorkshire in England, is about as simple as a Tymesaver can be — it’s two parallel tracks with complementary crossovers forming a runaround loop. This 1x4ft (30x120cm) switching shelf was built to demonstrate that you don’t need endless space and a complicated track plan to create a fulfilling P4 layout (4mm to the foot running on exact-scale standard-gauge metals of 18.83mm). The video clip below shows part of a typical shunting session at an exhibition, and gives a good picture of why switching puzzles are such fun to solve! Click on the triangle (lower left) to begin. The tradeoff here is that there is reduced room for interesting scenery amongst all those tracks. However, the added switching/shunting opportunities make this a worthwhile addition for switching fans. With less than two weeks remaining, Chris Gilbert, from the West Midlands of England, agreed to provide a substitute layout for a local exhibition when a friend became ill. Chris built an HO Tymesaver, 1x5ft (30x150cm) long, named Thomson Sidings after one of his sons. The shots at left and right show the layout under construction. At this point, Chris had spent about six hours of work on the project. 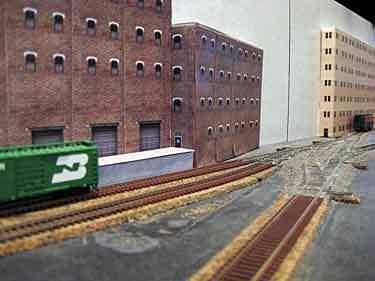 North American rolling stock were on hand for a layout scheduled to be exhibited next Fall, and the blue warehouse is a Walthers kit. 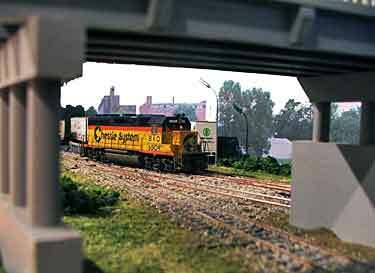 Highway overpass is another kit from Rix. The layout is built on 18mm MDF (fibreboard) with cork tiles laid on top. There are four positions to spot cars, and destinations are chosen by random selection. 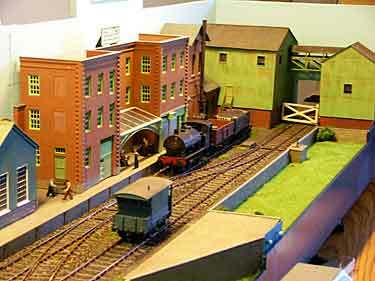 Below are a few shots of the layout as it appeared in the exhibition (last weekend!). A remarkable feat, performed in under two weeks! Paul Boehlert, from Atlanta, Georgia USA, adapted the plan for Mill Street from my layout, Wyemouth, using four wye (Y) turnouts, with inspiration from Diego De Bunder’s Wye River City layout, in Patagonia, Argentina. While my original plan uses offstage cassettes as a fiddle yard, Paul chose to build his lead track on an Atlas plate girder bridge over a small stream, providing an attractive scenic fiddle track in plain sight. 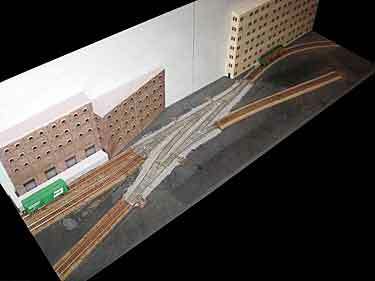 Paul is planning an extension micro layout, to be connected to Mill Street at the bridge. The new layout will be a classic 1x4ft (30x120cm) line in the form of a 3-2-2 car Inglenook. Each layout will then act as a fiddle yard for the other! 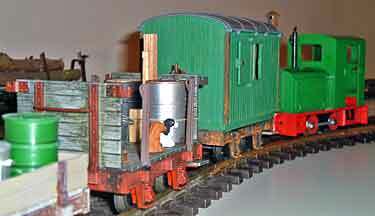 Alan Cox, from Swansea, Wales, designed this two-shelf N-scale Tymesaver to echo the Burry Port & Gwendraeth Valley, an interesting Welsh railway that lasted until the end of coal mining in the area. Alan explains, “Built on the cheap it was run in part down the canal bed it replaced, so regularly flooded and had sharp curves and extremely low bridges – so low that only a few locomotives with cut down cabs could use it, and so restrictive that everything was handled by small shunting engines, sometimes in twos or threes. 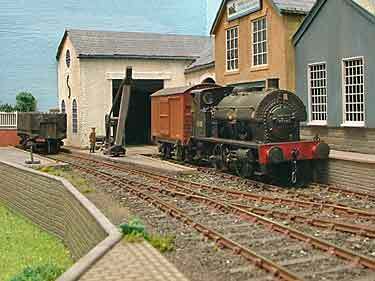 Note that this layout can also be operated as an Inglenook, using the system explained by Alan in Scrapbook #69. In Scrapbook #57 we examined Kevin Payne’s classic H0n30 exhibition layout, Orznash, and commented that he was working on a larger-scale version of it. This has turned out to be 1:18 scale and is called Orsnash, a spelling variant of the same place. Measuring 2×0.6m (79x24in), the layout is built on two IKEA tabletops, each 1×0.6m, resting on inexpensive IKEA trestles. 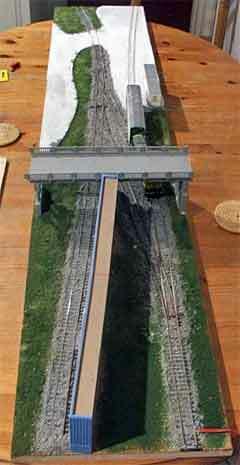 Core of the track plan is two elements from Modellbau-Heyn: a superb little turntable (drehscheibe) and wye switch (Y-Weiche). Rolling stock is heavily modified LGB. We’ll keep you posted as work progresses on this unusual line! MELDING A TYMESAVER WITH THE PIANO LINE … EUREKA! Simon also explains, “The fiddle yard is a traverser which allows five wagons to stay on the moving part and the loco to go to a fixed part at the end. The traverser moves to place a clear piece of track in front of the loco so that it can run round the wagons before drawing them off into the yard again. It is done in such a way that there are also short storage tracks for another loco or for a couple of wagons so that the sequence can have some variety.” The whole layout runs on DCC, and to top it all off, it also packs up nicely for easy transport (lower right photo). The plan itself is a Tymesaver. There are a small fuel tank farm with loading/unloading facilities, a dock crane, goods handling buildings, and a small coaster vessel. Rolling stock will be tank cars and suitable goods (freight) wagons. Norman’s supply routes are tenuous, as no scale model parts are available in the UAE, so everything must come by mail, or with colleagues returning from overseas, or what can be obtained at the local Ace hardware DIY store. We’ll be following his progress with great interest. Tracy Smith, from Bothell, Washington USA, is building this good-looking shelf layout on a base made of gatorbaord scraps discarded at his workplace. 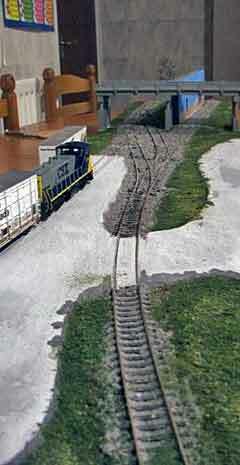 The Tymesaver plan is modeled on Gordon Avis’s Fairweather Branch Line, described elsewhere on this site. We’ll look forward to watching this line take shape, in future updates. Joern Pachl, from Braunschweig, Germany, builds TT layouts to recreate scenes of German railways and illustrate railroad operating practices. He’s a professor at Braunschweig Technical University, specializing in raiload technology. 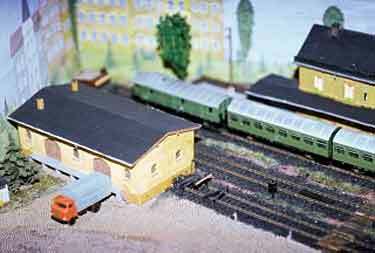 Joern kindly sent information about two early layouts he built while still a student in the 1980s and early 1990s, both based on real stations in Germany and both being Tymesavers. 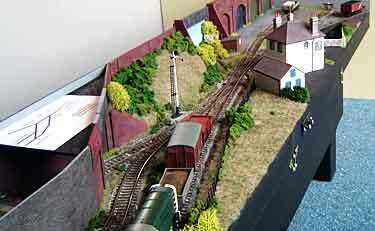 Here’s a glimpse of the two layouts; there’s more at his website. 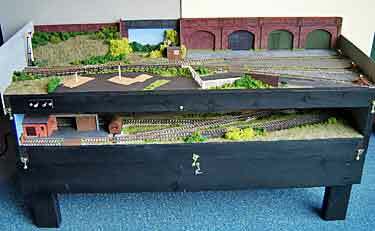 Joern’s very first model railway, built in pre-university days while he was still living at home with his parents, was this 200x35cm (79x14in) railway called Eibenstock. 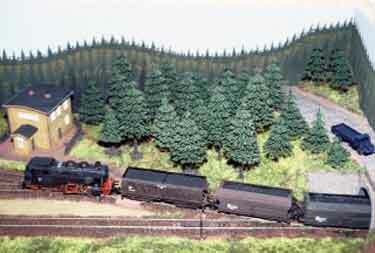 It’s based on a real terminal station located at the foot of a very steep grade, the former Eibenstock Ramp. All departing trains had to run uphill, and so the locomotive was located at the rear of the train. As a result, the storage yard (fiddle yard) can be a simple ladder of track, covered by trees at the right end of the layout! 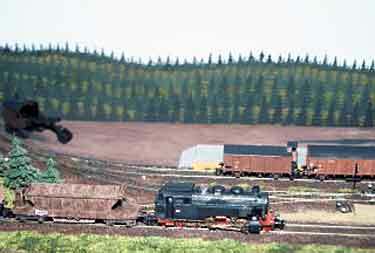 The locomotives were scratchbuilt because no commercial models of them were then available. A fascinating possibility is the opportunity to model the lower end of the grade and use gravity switching to work the terminal (see Fulpmes in Scrapbook #69 for a similar arrangment). Joern’s model did not explore this possibility, and he later gave it to a modeling colleague who planned to include it as part of a larger layout. Braunesumpf was built as a very small layout, 140x30cm (55x12in), to fit in Joern’s university student’s apartment. 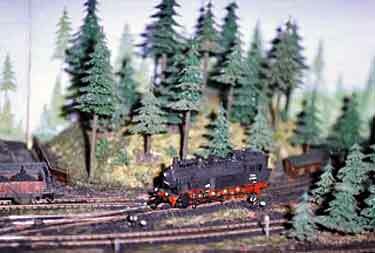 It models a small intermediate station on a mountain branch of the former Halberstadt-Blankenburg Railway (HBE). 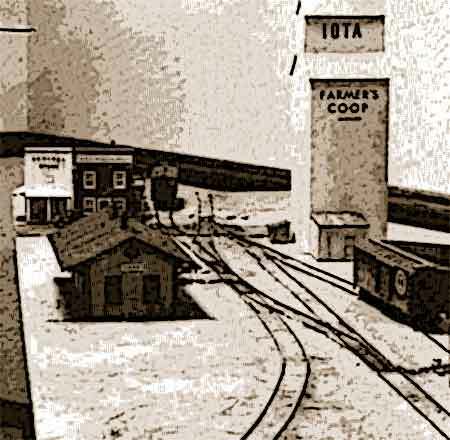 Since a storage yard was not used, operating sessions were restricted to local shunting work of freight trains, conducted within the limits of the baseboard. Turnouts were homemade by Joern. He gave this layout to the same lucky friend when he moved away, but retained the rolling stock for use on his current railway, Drei Annen Hohne (see Scrapbook #67 for more). 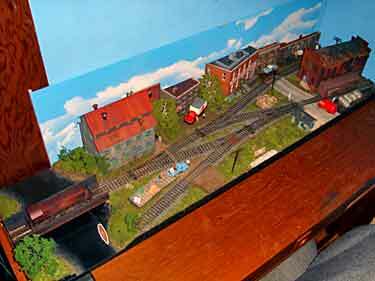 Greg Elems, from Reno, Nevada USA, is building his Tymesaver in O scale on a hollow-core door (photo at right). 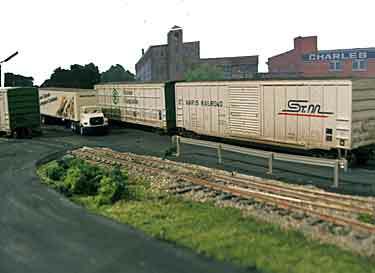 Scenery awaits the construction of another track switch, to be located about where the Baldwin diesel locomotive is sitting, providing a kickback spur to further complicate the switch crew’s lives. Meantime Greg has fun running switching sessions on the partially completed line. ONE GOOD TRAM DESERVES ANOTHER! …and Jack, an inveterate tinkerer, immediately added a fold-up sector table (below) that greatly enlarges the track capacity of the layout by providing a two-track yard at the rear! “The sector table pivot is on a pull-out (or swing-out) arm,” Jack explains mildly, so it can be folded away when not in use. The scope of future shunting puzzles could be much enlarged by including car-spotting points in the Back Yard, so to speak. 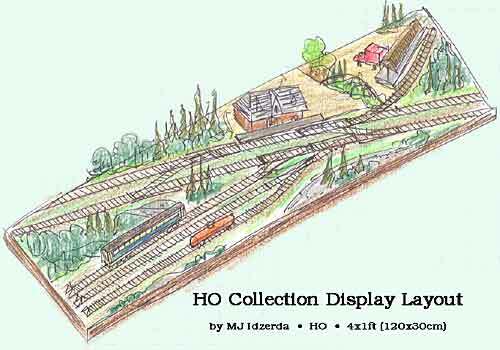 For several years now, readers have been sending me references and photoscans of a layout called Iota, which appeared in Railroad Model Craftsman magazine for May 1972. It’s a straightforward HO Tymesaver-type plan in a 56x17in (142x43cm) space. It was published six months before John Allen’s Timesaver ran in Model Railroader magazine (November 1972). At left are an artist’s rendering of the layout (based on an RMC photo) and a redrawn track plan. Note that all shunting can take place within the baseboard itself. Iota is a testament to the lasting popularity of these little switching layouts. It still has an enthusiastic group of fans, after 35 years! EDITOR’S NOTE. There are a great many inspiring Tymesaver layouts scattered throughout this website. To help you find them here are a few links to the principal caches: there’s a Tymesaver page in the Micro Layout Design Gallery, as well as a bunch of them in both the Dense Tracks and the End of the Line pages. Two Scrapbooks have featured Tymesaver layouts: #42 and #53, and there are some outstanding examples in other Scrapbooks — #14, #42a, #47, #57 and #59. 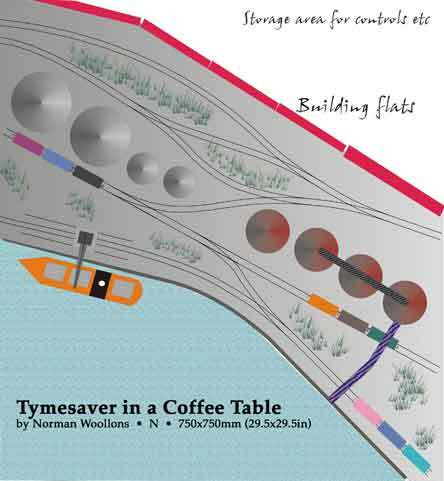 The Tymesaver is one of the most popular track patterns in model railroading, as well as on the real railroads! —Carl. Paul Boehlert’s Mill Street Layout is still alive and well in Etowah, TN. I bought the little layout from Paul and still run it often.